During Mass Effect, the player will assume the role of Commander Shepard, who is a fully customizable character from background, combat specialty, and appearance. In Mass Effect 1, character customization happens immediately upon starting the game. Players are asked to reconstruct their profile as it has been corrupted. They may either then moved forward with creating their own Shepard or can simply choose to play as the default Shepard who is male, Earthborn, Sole Survivor, and a soldier class. 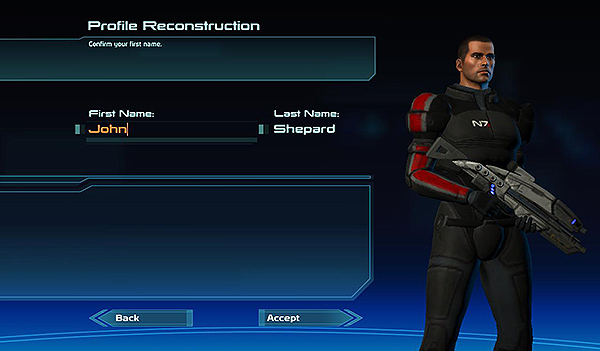 If players proceed with character customization, Shepard can have one of three backgrounds (AKA: Pre-Service History), Earthborn, Spacer, and Colonist. The choice will effect some minor missions and interactions in all three games. Earthborn Shepard: Orphaned at a young age, Shepard grew up in one of the large cities on Earth and ran with a gang called the Reds. Earthborn Shepards enlist with the Alliance when they turn 18. Spacer Shepard: A child of the Alliance, Shepard’s parents are both enlisted in the Alliance and move frequently. Spacer Shepards enlist with the Alliance when they turn 18. Colonist Shepard: A child born on one of the many human colonies, Mindoir. At the age of 16 slavers attack the colony, killing all of Shepard’s family and friends. Colonist Shepards are saved by the Alliance and later enlist at the age of 18. In addition to Shepard’s area of birth and childhood, there are three additional choices for events that occur after enlistment with the Alliance, this choice is considered Shepard’s Psychological Profile. Sole Survivor: Shepard is the lone survivor of a Thresher Maw attack during their Alliance deployment. Their entire unit is killed on Akuze. War Hero: Shepard single handedly saves a colony on Elysium from Batarian Slavers and is awarded the Star of Terra (the highest Alliance honor available) for their efforts. Ruthless: Shepard sends a large part of their unit to their death to achieve a victory. In retaliation for the Skyllian Blitz, a Ruthless Shepard will join other Alliance forces by raiding Torfan, a Batarian colony. This earns them the nickname “The Butcher of Torfan”. The player’s Psychological Profile choice will directly effect Shepard’s starting Morality at the beginning of the game. 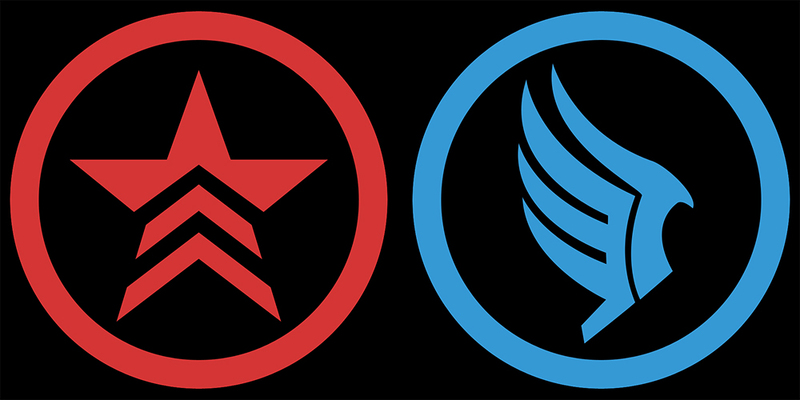 Morality in Mass Effect is defined as Paragon (blue) or Renegade (red) and will help/hinder the player’s ability to successfully resolve certain issues. Morality in ME1 is also linked to the Charm and Intimidate (non-combat related) skills. Sole Survivors will start with both Paragon and Renegade points. War Heros will start with Paragon points. Ruthess Shepards will start with Renegade points. Paragon/Renegade choices will present themselves to players throughout the game and are also effected by how many points the players assign to Charm and Intimidate in their skill tree. Paragon choices and options are often accompanied by compassionate and diplomatic dialog while Renegade choices are usually paired with a snarky or forceful dialog. Both sides of morality can help diffuse entire battles. There are minute differences in the game if the player decides to run Paragon or Renegade. David Anderson will assign a specific mission once their Shepard receives an 80% allocation of either Paragon or Renegade points. The ending cutscene will also differ slightly. It is possible for players to float between a Paragon or Renegade Shepard and this type of Shepard can be called a Paragade or Renegon, depending on the balance of their morality. Once the player makes their background and psychological profile choices, they will also choose their Military Specialization, or class. There are six classes to choose from. Each class can effect the player’s style of combat drastically and will also effect the weapons they are able to use comfortably upon starting the game. Three of the six classes feature biotic abilities. Biotics can either compliment weapons usage or be used in substitution for weapons if the player chooses. Three of the six classes feature tech abilities. Tech specialists use their abilities to help reduce enemy defenses through a variety of methods. ~ Eventual access to heavy armor. ~ Initial access to combat armor and assault training talents. ~ Secondary access to first aid and fitness talents. ~ Eventual access to commando or shock trooper talents. ~ Access to pistols, assault rifles, shotguns, and sniper rifles. ~ Access to light armor only. ~ Initial access to decryption, electronics, and first aid talents. ~ Secondary access to basic armor, hacking, damping, and medicine talents. ~ Eventual access to medic or operative talents. ~ Initial access to basic armor, throw, warp, and barrier talents. ~ Secondary access to lift, singularity, and stasis. ~ Eventual access to bastion or nemesis talents. ~ Access to pistols only after basic armor is leveled up. ~ Eventual access to medium armor. ~ Initial access to tactical armor, electronics, and decryption talents. ~ Secondary access to fitness and damping talents. ~ Eventual access to commando or operative talents. ~ Access to pistols and sniper rifles. ~ Initial access to throw, barrier, decryption, and first aid talents. ~ Secondary access to lift, stasis, electronics, and medicine talents. ~ Eventual access to marksman, bastion or medic talents. ~ Access to pistols only. ~ Initial access to assault training, throw, and warp talents. ~ Secondary access to tactical armor, lift, and barrier talents. ~ Eventual access to shock trooper or nemesis talents. ~ Access to pistols and shotguns. Weapons note: Classes are strictly limited to specific weapon usage in Mass Effect 1. If the player has achieved the required number of kills in a non-class specific weapon (75 kills) in any play through, they may, after the Luna mission, unlock a bonus weapon or power that is not limited by class. If the required number of kills has not occurred prior to that mission, the bonus use of a non-class weapon may not be obtained. Shepard will carry all types of weapons throughout the game even if they are not proficient in their use. Once players choose a class, they will move forward with the final step of character customization, appearance. Players will choose either a male or female appearance for their Shepard, as well as facial structure, hair color, and eye color. 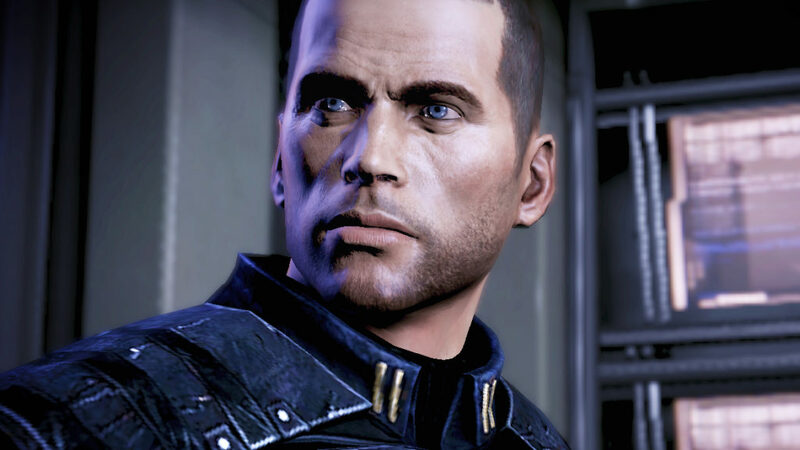 Default male Shepard is modeled after Mark Vanderloo and is often nicknamed Sheploo due to this. 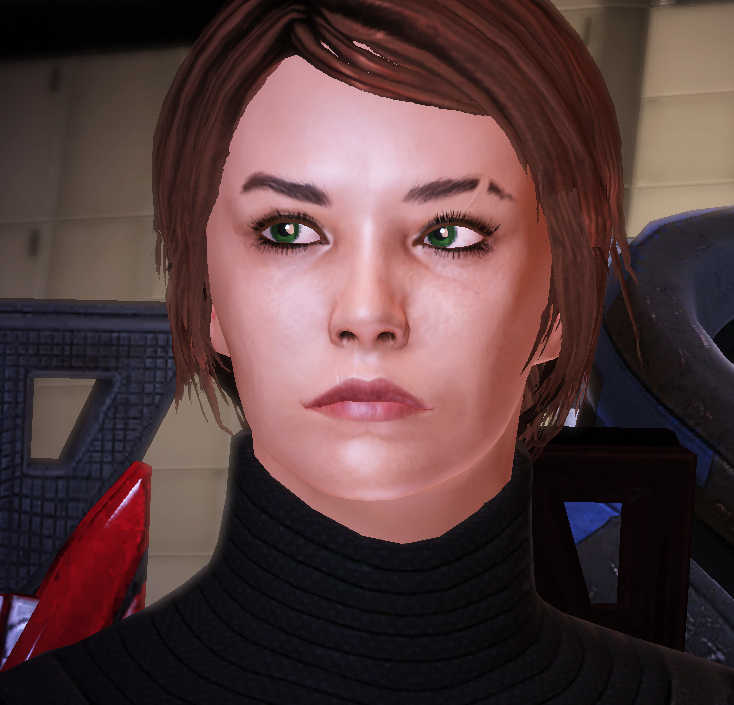 Default female Shepard has no facial model, but is often called FreckleShep. Once all details are confirmed, the player will see a cut scene with their chosen Shepard gazing out over a planet while a voice over conversation occurs between David Anderson and Donnel Udina. The two men discuss Shepard’s background and Spectre eligibility. Play begins shortly after that. At the start of Mass Effect 2, players will be asked if they would like to import their Shepard from Mass Effect 1 or if they would like to start with a new Shepard. If imported, all decisions made by the player’s Mass Effect 1 Shepard will be applied to Mass Effect 2. If not, the player will be asked to answer a series of quick questions that will shape their story. These questions include the background choices and psychological profile choices available in ME1. Shepards in ME2 will have similar, but not exactly the same class talents and powers as they have access to in ME1. Access to specific weaponry is also carried over from ME1. Once again, players may choose to import their Shepard from ME2 into Mass Effect 3. ME2 Shepards will have the choices they made in the previous game(s) follow them into ME3, including decisions and actions taken for squad loyalty and the suicide mission from ME2. 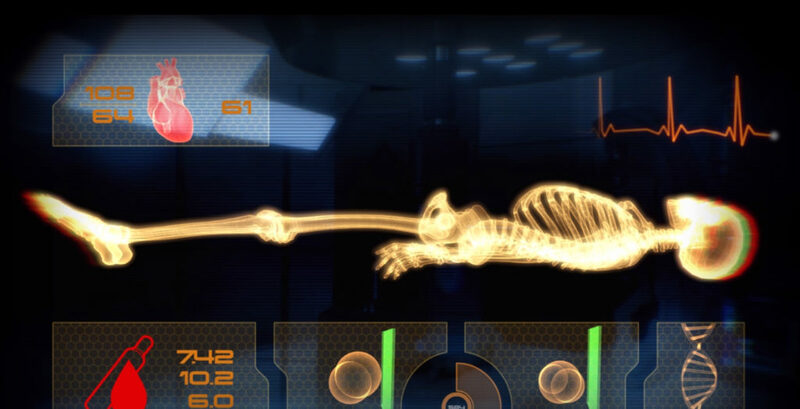 If a new Shepard is started, another series of simple questions will be asked in order to shape the story in ME3. Newly created ME3 Shepards may find their story lacking additional characters due to the effects of the suicide mission and squad loyalty in ME2. Shepards in ME3 will have class talents that closely match those experienced in ME2. ME3 is the only entry in the series where class choice does not limit weapon availability.